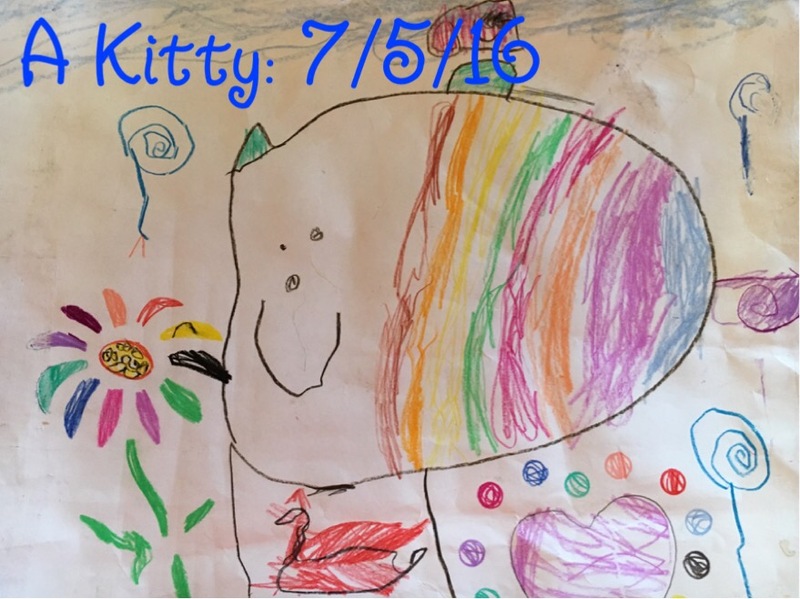 Back in early July, Raya decided to create a wonderful drawing of a kitty in a garden — Mimi helped her learn how to draw a cat that evening. 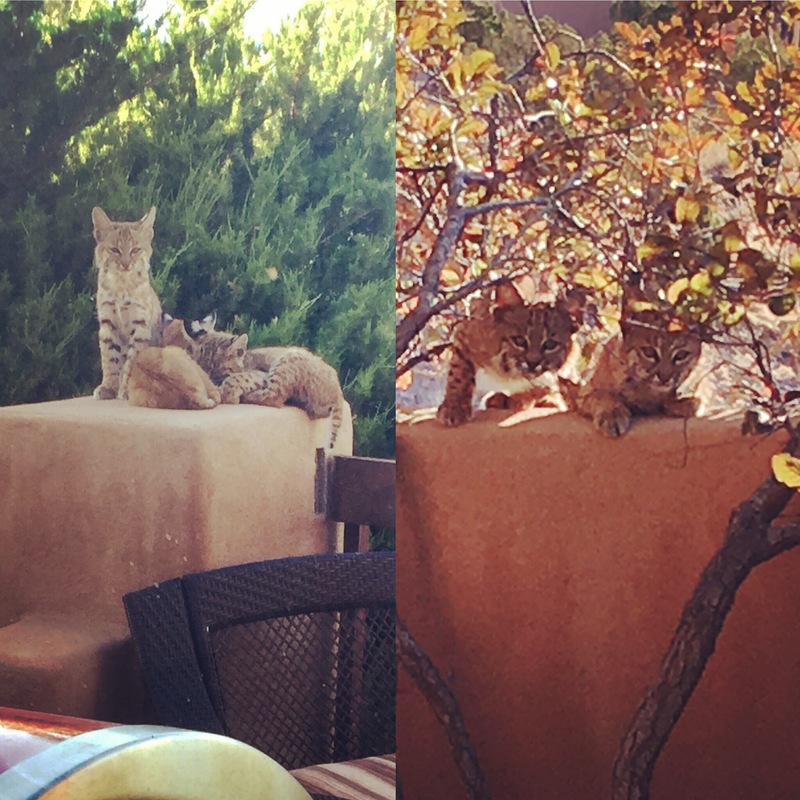 Raya must be psychic because the very next day, bobcats invaded our backyard and stayed on and off for weeks on end!! They’re incredibly gorgeous creatures, who we are lucky to have spent so much up-close time observing. The mom and kitties seemed very at peace with us and thought they’d found Eden — green grass and water in the arid, sweltering summer — and didn’t care that we “shared” the space. But once the mama brought back a male companion, things changed. His energy was different and he remained in protective mode whenever opened our back door. It felt like having a tiger in our yard. So we had to resort to throwing tennis balls in their general direction (we do have littles, after all). Our home had to remain housecat and kid friendly — and not bare the remnants of small animal carcasses that were devoured for lunch. They left but come back often. See the vids for some amazing footage (if I do say so myself). 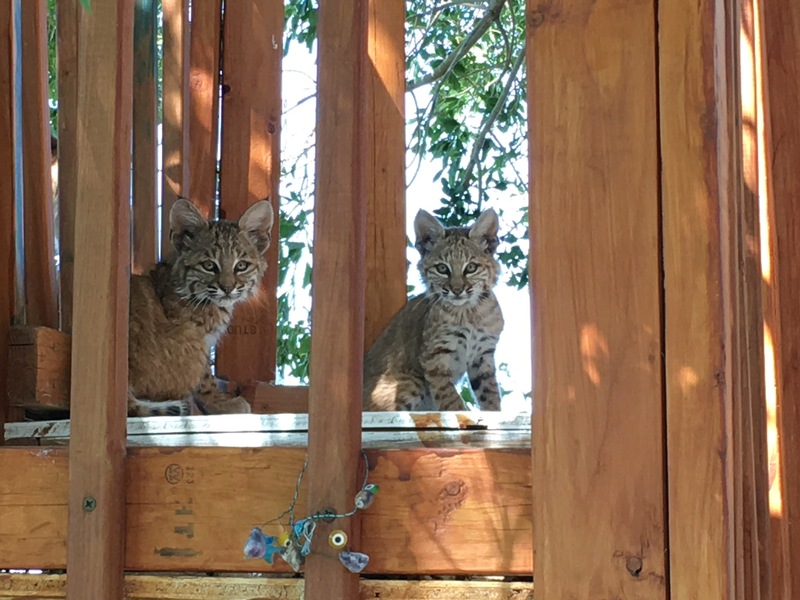 Greeting us in our backyard one hot July afternoon were three bobcat kittens and their protective but calm mama. This is one of several encounters we’ve shared with these wild cats near our home in Placitas, NM. The animals can be seen in the wild with some regularity in this part of the country, but rarely come this close. We observed their natural behaviors — which were similar to those of our house cat! They played with, chased and licked each other, tumbled around in the yard, climbed the walls, nursed their mama and ate their prey (a bunny not featured in the video).